Feb's first Tuesday falls on the 5th. Something good on TV that night? Watch it on Netflix or have a friend record it. Why? Because Gary Devries is going to demonstrate the cutting of half-blind dovetails for drawer fronts and the subsequent fitting of drawer fronts into casework. Maybe we will learn the secrets of how Gary accomplishes in a two hour meeting what takes some of us two days to do. As always we meet from 7 to 9 PM in the basement of the Bethany Baptist Church, at the intersection of Baseline and Centrepointe, the West one as Centerpointe meets Baseline twice. Come as early as 6:30 if you would like to help set up chairs. And bring your dry indoor footwear. 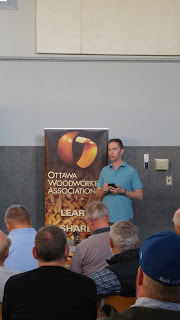 The Ottawa Woodworkers Association welcomes new members. Just show up and register at the desk. You may attend two meetings at no cost before deciding whether you'd like to join.